Cowls are no longer just for wintertime, but make a graceful statement in spring as well. Knit or crocheted from cotton and/or silk, you can wear these glamorous accessories almost all year round. 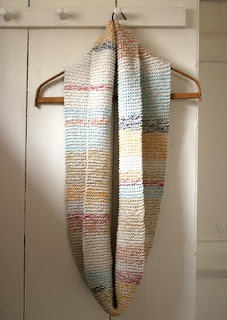 Purl Soho, a shop in New York knitnscribble has mentioned before, has offered a free herringbone cowl pattern, using a main color ecru cotton yarn mixed with different colors of brighter yarn, strategically placed, to create a lovely spring tube scarf, or use your favorite self-striping yarn. 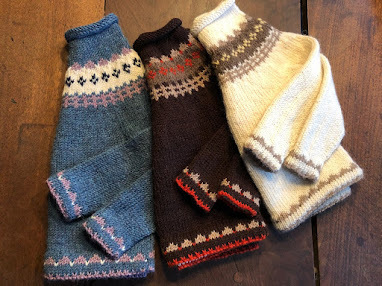 The pattern is an easy workup and posted at purlbee, Purl Soho's blog. Red Heart offers this crocheted "crazycowl" pattern for free. You can wear the cowl in so many different ways, over the head in the rain like a snood, around your neck as a scarf, or as seen here. This one is crocheted with four different skeins of 'light & lofty' and worn over the shoulders, a great way to set off a lightweight spring jacket in brisk winds. It'll take you no time to crochet with a 10 mm hook or US N-15. 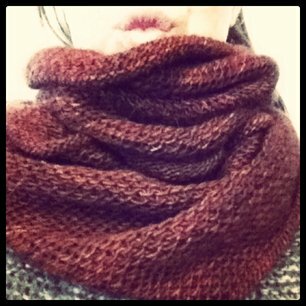 Tonya Hyde (MadGiddy on Twitter) sent me this photo of her Honey Cowl, a free pattern from Madelinetosh. The honey cowl can be knit with cotton or a blend of silk and cotton or bamboo. Gauge is not all that important for knitting cowls, just adjust the number of stitches, if casting on in the round for a perfect finished project. 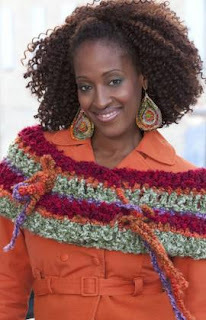 If knitting or crocheting as a scarf, then connecting the ends, adjust the length. 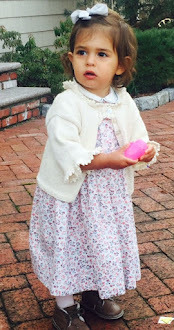 Thank you for sending the photo, Tonya; it's a darling shot! Tonya's Twitter profile states that she's an ex-pat living in Vancouver. Interests: knitting, buying local/handmade, tea, video games, healthy living, photography and puppies. Herringbone cowl pattern at purlbee. Red Heart Crazy cowl free pattern.